Tal Axelrod. The Hill. Fri, 19 Apr 2019 16:20:48 +0000. Reuters. Fri, 19 Apr 2019 11:41:05 -0400. Yahoo. Fri, 19 Apr 2019 01:38:40 -0400. MOSCOW (AFP) - With Russia's Vladimir Putin set for his first talks with North Korean leader Kim Jong Un this month, Moscow is eyeing a major role in yet another global flashpoint. Straits Times. Fri, 19 Apr 2019 10:47:48 +0800. CBS News. Thu, 18 Apr 2019 21:54:25 +0000. The North's foreign ministry said Pompeo was 'talking nonsense' amid failing efforts to reach a deal between Washington and Pyongyang over Kim Jong-un's nuclear ambitions. Daily Mail. Thu, 18 Apr 2019 16:48:22 +0100. ABC News. Thu, 18 Apr 2019 09:50:18 -0400. Helen Mukhina. Kyiv Post. Thu, 18 Apr 2019 11:36:02 +0000. Sky News. Thu, 18 Apr 2019 12:06:00 +0100. Sydney Morning Herald. Thu, 18 Apr 2019 21:00:00 +1000. BBC News. Thu, 18 Apr 2019 10:29:18 GMT. Peter Stubley. The Independent. Thu, 18 Apr 2019 09:49:00 GMT. Tass. Thu, 18 Apr 2019 12:15:27 +0300. CNBC. Thu, 18 Apr 2019 07:47 GMT. Anthony Kuhn. NPR. Wed, 17 Apr 2019 23:43:00 -0400. David E. Sanger and Choe Sang-hun. New York Times. Thu, 18 Apr 2019 02:31:54 GMT. BBC News. Thu, 18 Apr 2019 02:13:36 GMT. CBS News. Thu, 18 Apr 2019 00:47:39 +0000. 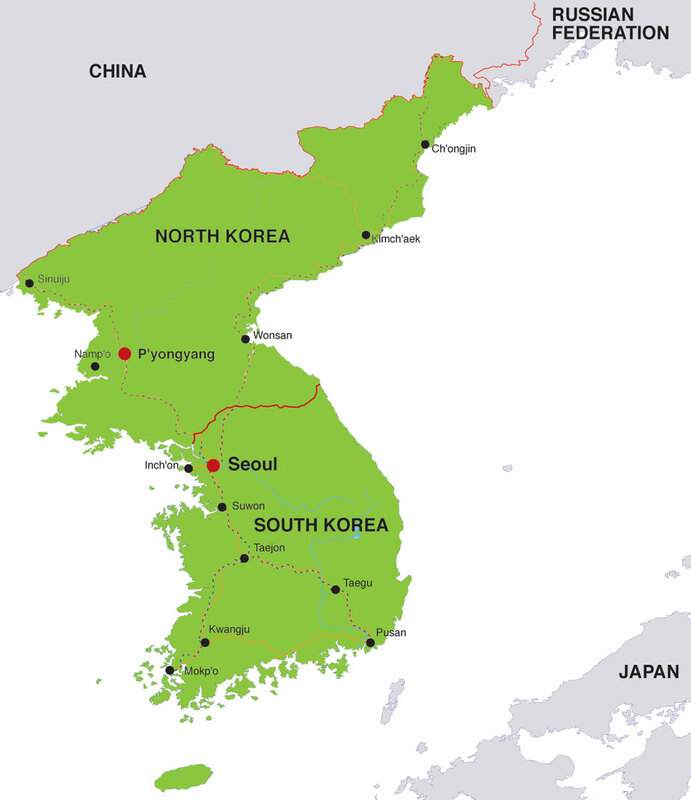 The Korean Peninsula, located in northeast Asia, comprises the states of North Korea and South Korea. The Democratic People's Republic of Korea, also known as North Korea, is located in the northern part of the peninsula. North Korea's capital city is Pyongyang, and its national currency is the (North Korean) Won. Korean is the country's official language, and in 2007, the estimated population of North Korea was 23,302,000. For more news and information about North Korea, visit the official DPRK website. The Republic of Korea, also known as South Korea, is located in the southern part of the peninsula. South Korea's capital city is Seoul, and its national currency is the (South Korean) Won. Korean is the nation's official language, and in 2007, South Korea's population was estimated at 49,045,000. For more news and information about South Korea, visit the official Republic of Korea website.